For more than 30 years, residents in the Burlington WA area have been visiting the dentist at Gentle Dentistry in Mt Vernon. Just minutes south of Burlington via I-5 and less than a mile east off of the freeway in Mt Vernon, the tradition of excellence continues at Gentle Dentistry with dentist Dr. Eunice Kim. Many of Dr. Kim's patients travel from Burlington WA for their regular check-ups and for other major and minor dental procedures. Dr. Kim is a general dentist and a cosmetic dentist so you can have healthy teeth and a beautiful smile. She is also a sedation dentist for Burlington WA to help those that are afraid of the dentist receive the care they need or those with time pressures to receive multiple procedures in one visit. 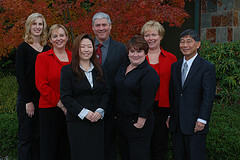 To learn more about Burlington WA dentist, Dr. Eunice Kim, contact Gentle Dentistry in Mt Vernon WA today or fill out the simple form on this page to schedule an initial consultation.